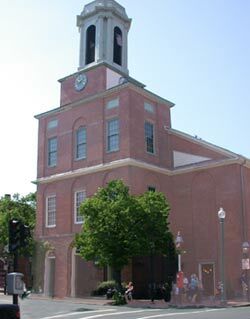 The Charles Street Meeting House has lived as many lives as any other building in Boston. Its been home to three congregations, progressive causes, retail stores, a residence and offices. In 1920 it dodged demolition, literally, by being moved ten feet toward the river to make room for the widened Charles Street. It was saved again in the 1980's as it took on a new secular life. In 1804 carts of dirt were still coming down the side of Beacon Hill as it was built out. Asher Benjamin, who's copy book, Country Builder's Assistant, was widely circulated among American builders. He was likely influenced by Federal style popularized by Bulfinch on Beacon Hill. Its overall symmetry, use of blind arches, fanlights, and smooth brick place it in the Adam's-Style Federalist tradition. Rather than a steeple, it is topped with an octagonal cupola. Originally build for the white Third Baptist congregation, the Charles Street Meeting House hosted a range of abolitionist speakers. Eventually part of this congregation split off and formed the first integrated congregation in the US, Tremont Temple. This history is detailed as part of the Black Freedom Trail. In time the Meeting House was home to AME and Unitarian Congregations. But the 1980's found the church vacant and facing destruction. Architect John Sharratt restored it, generally preserving the exterior, while accommodating retail shops on the first floor, and his home and office on newly established second and third floors.